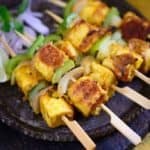 Mango Mint Paneer Tikka is a Mangolicious twist on the regular paneer Tikka. Make it and impress your family and friends. Here is how to make Mango Mint Paneer Tikka. Mango Mint Paneer Tikka is one of the favourite vegetarian snacks in our family. The soft, melt in your mouth chunk of Indian cottage cheese marinated with yogurt and spices grilled to perfection and served along with slices of tangy onion and Coriander and Mint Chutney, the thought itself is enough to water my mouth. This time, however, I gave a Mangolicious twist to my regular Paneer Tikka. The marinade was made using fresh mango puree, hung curd, fresh mint leaves and a few spices which enhanced the flavour of the delicious dish. The Mango Mint Paneer Tikka turned out fabulous and I will highly recommend you try this recipe before mangoes disappear from the market. Serve Mango Mint Paneer Tikka as an appetizer for those elaborate meals or present this dish as a snack on lazy afternoons of the weekend: they taste yummy round the clock! Now quickly take a note of recipe for this delicious treat and make it for tasting a different flavor this Summer. Mango Mint Paneer Tikka is a Mangolicious twist on the regular paneer Tikka. Make it and impress your family and friends. Mix hung curd, mango puree, garam masala powder, cardamom powder, Kashmiri red chili powder, turmeric powder, vegetable oil and salt in a bowl. Add mint leaves to the mixture. Cut paneer into small cubes and add it in the marinade. Cover the bowl with a cling wrap and let the paneer marinate for 1- 2 hours. 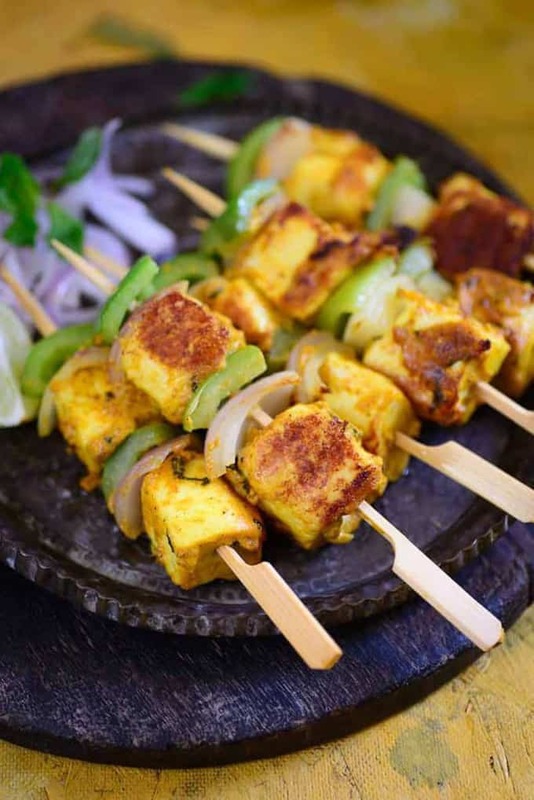 Thread the marinated paneer, capsicum and onion in wooden skewers. Heat a grill pan and add some oil to it. Grill the paneer skewers till slightly browned from all the sides. Thnx Anjana. It’s made using ripe Mangoes. Will edit the post.